Tuesday, March 20th was the official first day of spring and summer is right around the corner. You know what that means right? The time has come to break out your flip flops and sandals. Wearing shoes for warmer weather gives your feet a sense of freedom when the fresh air hits your toes. Sandals and flip flops can be fun and easy to slip on and off, but they tend to be the least ideal for proper body alignment. Without the right foundation this type of footwear causes problems for your legs and feet. It’s hard to imagine such popular footwear contributing to foot pain, muscle strains or spasms, calluses and blisters. · Use antibacterial and antifungal spray. It’s better to use antibacterial and antifungal spray to prevent bacterial and fungal infections such as athlete’s foot. · Purchase cushioned footwear. It’s better to choose footwear that has a reasonable footbed to include a heel cup and some sort of inside arch. It’s even better along with an outside arch. Memory foam may feel good at first, but it will not control excess motion that may end up causing pain the next day. · Sandals or flip flops. Flip flops rely on your big and second toes to squeeze together to keep footwear on your feet. This causes strain for your toes and is unnatural, which disrupts your standard walking structure. 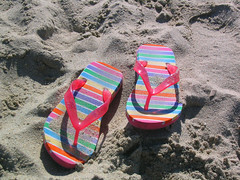 Flip flops also tend to shorten your stride making you walk slower. You should look for sandals preferably with a strap along the front of your feet as well as along the heel bone as this will better control the feet for a more natural motion. Medical flip flops and sandals from ArchMasters will give a natural feel as they are only for specific types of feet and therefore are only available to doctors. Orthaheel sandals and flip flops have the needed arch support that will not cause strain for your toes and will feel more natural than sandals without arch support. · Stretch your feet and toes. Stretch and massage the muscles of your feet and toes before and after wearing flip flops or sandals. In the morning, put your toes and all your foot joints through a full range of motion, including “cracking” them like a chiropractic adjustment – just like your mother told you not too because it would give you arthritis! · Use orthotics or shoe inserts. At ArchMasters, we can fabricate orthotics for sandals from hard to soft and they even can be moved to utilize in your athletic shoes. If you are looking for comfortable sandals, flip flops, or custom orthotics that will provide greater support, look no further than ArchMasters. Check out these comfortable, beautiful sandals by Naot, Dr. Andrew Weil, Orthaheel, Finn Comfort, Birkenstocks, or even these flip-flops – You’ll be surprised that quality and ideal fit summer shoes can look this stylish! Not only will you look nice, you’ll be saving yourself from future aches and pains. ArchMasters:Orthotics, Shoes & Footcare, llc. If you have any questions or would like to speak with a trained Podiatrist, contact our store at (615) 370-3000. And “Like” us on facebook for more information and pictures! Dr. Steve Rosenberg: Can Lack of Arch Support in Sandals and Flip Flops Cause Foot and Leg Problems?